As noted in an official blog post, Linden Lab has issued another set of new Starter avatars. The eight new avatars are all of the “classic” type, using the basic Second Life system mesh, rather than dedicated mesh body parts (although they have mesh clothing items). Between them, they offer a mix of more “everyday” types – as the official blog post again notes, previous starter avatars heavy leaned more towards the fantasy side of things. Bitsy (complexity 15,813) and Ashton (17,268): two twenty-somethings(?) with an up-and-coming urban air and style, complete with pet dogs. Gretchen (complexity 29,332) and Leonard (10,656): two older characters in more formal wear. Monty (complexity 19,016) and Trixie (14,732): two younger avatars with the look of teens or early twenties, Monty coming with an electric guitar. Greg (complexity 10,733) and Monique (9,226): two possible ’70s throwbacks. All are, as per the Lab’s usual procedure, supplied with No Mod elements (although the shapes are Modify). Surprisingly, given recent additions to the starter avatars, no discernible AO are provided (although some have poses that are activated on wearing them), with Gretchen being the notable exception to this approach. This lack of AO leaves the avatars with the horrendous Duck Walk. I also admit to being a little confused by the promo picture used for the avatars: it shows Ashton with his dog on a leash, but so far as I could tell, the only option supplied with the avatar is a “carry” version of the dog. 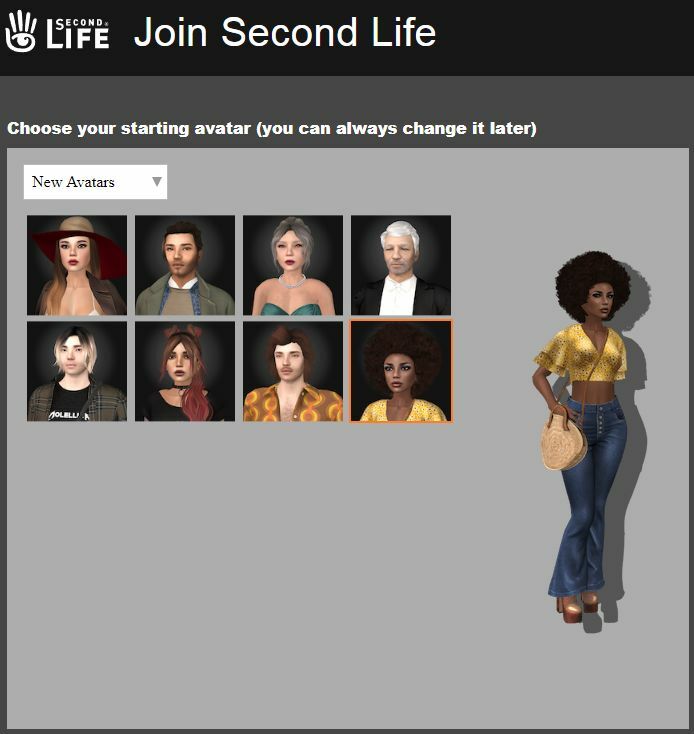 As starter avatars, these new looks are directly available to new users accessing the Second Life sign-up page on the web. Those already in-world can take them for a spin from the Me (/ Avatar) menu, and then selecting Choose Avatar. This will bring up the avatar picker (shown expanded, below), which will automatically default to the eight new avatar styles, then simply pick on the one you want to try. Selecting an avatar will see it replace your current look (so if it’s a new look you’ve put together and haven’t saved – be sure to do so first! ), and add the avatar to your Clothing folder. Or, if you prefer, you can open Inventory and navigate to Library > Clothing > Initial Outfits > then right-click on the relevant folder name and select Replace Current Outfit. This will also cause the look to be worn and copied to your own Clothing folder. Having a broad choice of starter avatars is a good thing; I’m just a little surprised these come largely sans an AO; in this respect they seem a little at odds to previous classic and mesh starter avatar updates. Endless is a region of desolate beauty that is quite stunning to behold in its naturalness of setting. There is a wild, unfettered allure to it that can instantly capture the eye and the heart. We were drawn to it thanks to an IM by fellow grid traveller Annie Oh (AnnieBrightstar). A Full region, it has been designed by Sombre Nyx (SombreNyx) in reflection of a coastal wetland or fens, and influence by the Camargue in the South of France. It offers a mostly low-lying area of land, cut through with shallow waters hidden by shrubs, tall grasses and reeds, weathered old bridges linking the swathes of drier land that sit just above the waters. All of which is watched over by the tall finger of a lighthouse and the squat box of an old fortification hunched on a low hill. The latter looks across the lowlands to a ridge of hills, a dirt track curling around them, hinting that something may be hidden beyond their steep sides, while overhead dull clouds scud their way across a sombre sky; perhaps portents of inclement weather yet to arrive. This is a place that has an immediate impact on the eye and heart; it breathes a naturalness that is almost intoxicating. In looking around on our first arrival, I was immediately put in mind of remote coastal areas of north and east Scotland – but also found myself put in mind of the moors of Devon, North Yorkshire and Northumberland, the wetlands and flamingoes notwithstanding. But Endless is a place that could exist almost anywhere; including purely in the imagination. Stand in a corner; drink in the ocean. Nobody will come to push you out of that reverie. They have their own to engage them … You’re the writer of stories made here. I offer you the pen. Dipped in the ink of my dreams. Where you choose to wander on arrival is up to you; the landing point sits towards the middle of the region, and the track winding forth from a nearby barn, hugging the feet of the sheltering hills is certainly one path to take – although this quickly branches, demanding choices to be made. But there are also paths between bushes and shrubs and the low bridges spanning fingers of water that also call for feet to tread them. And then there is the lowering bulk of the old fortification sitting on its hill, its call to be explored perhaps a little too strong to be resisted. Old it may well be, but the rooms within it offer the warmth of a fire, the comfort of a sofa and the hint of an artist’s place of work, while the crenelated walls of its flat roof enclose a most curious yet comfortable setting – although I’d perhaps question taking a bath with what sounds like a cold wind buffeting those same walls. Should you follow the track around the hills to their northern flank, you’ll find more signs of human habitation and stories waiting to be told. From Tuscan villa to fisherman’s shack, the buildings sitting in the northern lee of the hills offer a delight to both eye and imagination as they face the cold, hard sea in an almost defiant line. Close by, on a small tongue of land sits a graveyard, adding a sense of settlement and history to this place of stark pulchtricude. Nudge your horse through shrubs, listening to its hooves squelch in the mud … Notice a duck, a dead bird, a narcissus, a slice of freshly cut orange, brilliant on its white plate. Be aware of it all. Her description also hints at a further attraction: the region is perfectly suitable to exploration on horseback, if you have a wearable horse. I don’t as yet, but I confess the promise of being able to ride through Endless at a slow pace, imagining that mud sucking at hooves and the hypnotic swaying induced by riding while looking out over that serene landscape has brought me one step closer to doing so. Yes, there is a lot going on in the region that can pull at viewer performance (including an element yet to open to the public). But with careful shepherding of viewer options, these should not prove insurmountable or unduly spoil a visit. Certainly, the effort in making adjustments is more than worthwhile, because Endless is a genuine place of beauty and peace, perfect for photography, for contemplation, for exploration or as a means to recapture memories of the wilder, more remote places we cannot always visit with ease in the physical world. At the time of writing there was no server release thread, I’ll update this article should one surface. The following notes are directly from the Simulator User Group. On Tuesday, January 29th, 2019 the SLS (Main) channel was not update, and remains on server maintenance package 19#19.01.09.523003, comprising logging to gather baseline information on simulator performance in various areas of interest together with additional logging. BlueSteel will hopefully receive an update to the EEP code. However, this is dependent on Rider Linden resolving a bug that is currently blocking EEP progress. This causes the time on a EEP region to become “stuck”. Magnum and / LeTigre will receive a server maintenance package, details undefined; the other should receive an update with internal changes. Being able to flip between mesh objects via script used to be possible in SL. However, it was blocked as it was being used as a means to animate meshes – but not very efficiently (the option places a lot of strain on the asset and physics server). Recently, there have been requests to re-enable the capability because “now we have Animesh, there’s no need to flip this way.” There are also some use-cases that could benefit from the capability – such as being able to provide customisation options to customers who can then use a scripted mean to add them. However, as Oz Linden pointed out, the availability of Animesh doesn’t necessarily negate mesh UUID flipping being abused. There is also a risk that the ability could be used to enable IP theft, and the approach – as noted – doesn’t really fit with the current SL design due to things like the asset load, etc. Ergo, it is highly unlikely to be allowed. If you’re a QA engineer and in the San Francisco / Bay area, you might be interested in a QA job at Linden Lab working on Second Life.